For Thanksgiving this year I now had to plan on one more Celiac to feed. My daughter, Amy, just had a diagnosis of Celiac. This was not entirely unexpected as it is an inherited disease. 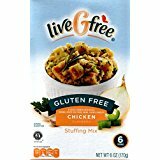 I recently found the LiveGfree products at Aldi’s stores. I have been impressed with the quality and taste and the price is much better than many of the foods on the market. The bread and buns are the only brand that I find worth eating and paying the price for. They are also available from Amazon if you do not have a Aldi store near you. If you do and have not shopped there you might want to give it a try. I was so pleased to discover that they had a stuffing mix and bought it to fix with the turkey this year. They ate all of two boxes of the mix so you could say it was a big hit. I sautéed some onions and celery about a half cup each in the butter called for in the directions and used chicken stock for the liquid. Followed the directions on the box and than put it in a casserole dish and in the oven for about 20 minutes so there would be some crisp pieces. Also splurged and bought a box of King Arthur muffin mix. The photo on the box is deceptive as the add ins are not in the box but an option if you want to use them. This was also excellent and so we had a hot bread and stuffing that everyone ate and Amy and I could have. A small thing to be thankful for. Amy tried liveGfree cake mix and said it was quite good, so if you need a birthday or Christmas cake you might want to try one. 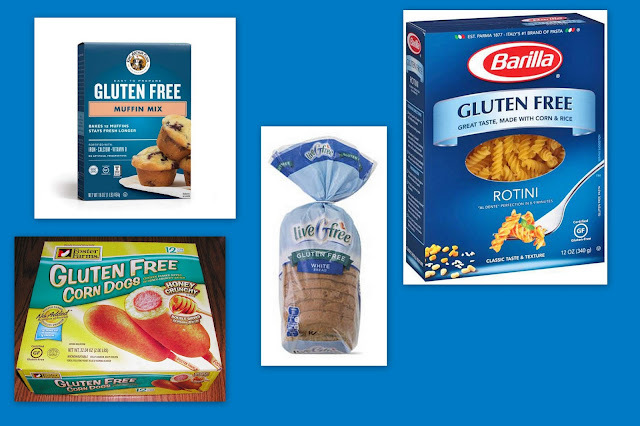 There are only a few things that I am willing to spend the extra money for and along with GF Rice Krispies, Foster Farms Corn Dogs and Barilla Pasta these liveGfree will now be among them.